Although many angiosperms are serviced by flying pollinators, reports of wings as pollen vectors are rare. Flame azalea (Rhododendron calendulaceum) is visited by diverse insects, yet previous observations suggested that only butterfly wings may transfer pollen to stigmas. We used an experimental approach to determine whether butterfly wings are the primary vehicle of pollination in flame azalea. Over two seasons of observations, only butterflies (Papilio glaucus and Speyeria cybele) contacted both anthers and stigmas, yet because of differences in wing-flapping behavior, P. glaucus transferred pollen most efficiently. In contrast, bee species specialized either on pollen or nectar but did not contact both anthers and stigmas. A field experiment revealed that flowers excluding butterflies experienced almost complete fruit failure, whereas fruit set in open flowers did not differ from those that were hand pollinated. 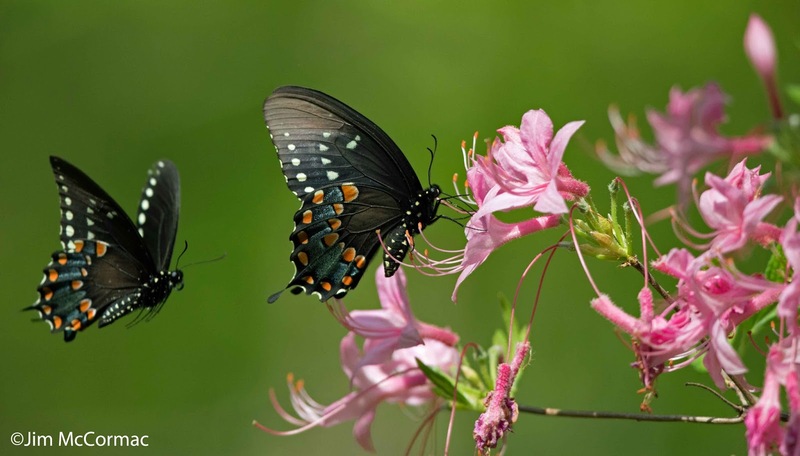 Additionally, butterflies had 56-fold more azalea pollen on their wings than bodies, while azalea stigmas bore both pollen and wing scales. These results suggest that plants with many visitors contacting reproductive organs may still specialize on a single guild of visitors for pollination and that wing-borne pollen transfer is a key mode of flame azalea pollination. 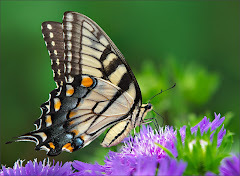 I've noticed this behavior in our back yard, when Tiger Swallowtails and Giant Swallowtails constantly flutter their wings while visiting large blossoms (not azaleas at our latitude). In the past I considered this wing motion a nuisance because it frustrated my attempts to get good photographic images, but I assumed it was done to achieve aerodynamic stability (though it doesn't occur with almost-as-big fritillaries, who hold their wings quite still). 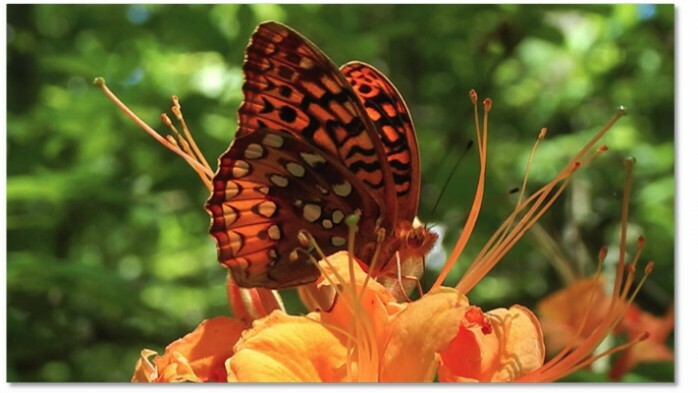 Top photo: Great Spangled Fritillary on a flame azalea, by Suzanne Allison, via NC State University College of Sciences News.